The year 2015 saw the 20th anniversary of AEWA. For the past two decades, AEWA has provided the framework for international cooperation on the conservation and management of migratory waterbird populations in the region - also serving as an example for flyway cooperation around the globe. 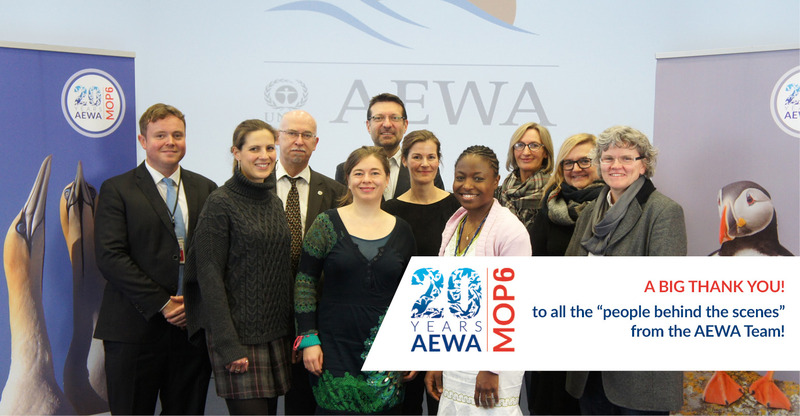 The Agreement’s 20th anniversary was celebrated throughout the year, culminating in the 6th Session of the Meeting of the AEWA Parties which took place on 9 – 14 November 2015 in Bonn, Germany. In particular, the UNEP/AEWA Secretariat was paying tribute to the people behind the Agreement in the form of a rolling “people behind the scenes” feature on this website, highlightening the work and dedication of the many government officials, NGO representatives, experts, consultants and stakeholders as well as project staff - without whom AEWA would not be able to function and deliver. To read all 20th anniversary profiles please click here.